THE BAND HALL (www.thebandhall.com)  We have all seen flags that were nothing short of stunning. Likewise, we've all seen our share that could only be described as horrendous. A great flag design is one of the easiest ways to please the GE gods. Design it well and it works for you the entire time it is in view. We will discuss these topics in a not so formal manner, to say the least. We're just throwing ideas out there for you to ponder. Hope it provides at least a bit of assistance. Here we go! How about a flag that looks like an entranced artist scrolled at random and allowed the shapes created to voice their choice of color? No? Well, what about panels of gradating size and color? All straight lines. The sewing moms will throw you a party! The possibilities are truly endless. It seems that each year bears witness to breath-taking, innovative flag designs as well as true new standards of ... well, some are just not very pretty. Motivated by the unique creations of their peers, some people just try too hard. A solid rectangular flag, almost devoid of design, continues to be used with great effectiveness. Sometimes it is better to keep things simple. What is the purpose of your flag designs? If it is solely to help your marching band entertain the masses at football games, then a tried and true design in school colors could be the perfect choice. Maybe you want to create a work of art. Do not hesitate to seek assistance if you feel uncomfortable assuming this responsibility. Some people are excellent equipment writers, top-notch technicians and remarkable managers who need to make a quick phone call to someone born with a paintbrush in hand. We all have our strengths and weaknesses. Don't be afraid to ask for help. Many times the shape of a flag's perimeter could be something other than rectangular. A curved flag is often useful, especially for large swing flags or "wings". When designing a curved flag, it is especially important to sew one first and watch someone spin it. You may want to change your pattern (usually to make it larger) before you waste a lot of material. Some designers slightly curve the top outside corner of an otherwise rectangular flag in order to stop some of the flapping. This reduces the drag and eliminates a slight distortion of the design. At the risk of stating the obvious, the design of a flag should be appropriate for the music being played. A flowing ballad may call for a curvilinear design. An angular design would be appropriate for a more excitement-filled number. A programmatic selection might dictate the use of a theme flag. It is certainly interpretive to change flag designs as the music changes. The various designs used throughout a show should nonetheless work well together. We've all recognized that flag that must have been one from last year's show. It may be smart to use an old flag to save money; just be careful your reason isn't obvious. One way to unify your flags (as well as the show) is to use the same design but with different colors throughout the show. If you plan to include a thematically inspired object (a cowboy boot for example) in your flag design, bear in mind that it must look attractive while being spun. Someone once told me that he could judge a flag by looking at the fabric scraps piles on the floor under the sewing machine. That is one way of saying that the most important characteristic of a flag is its color. It is not a good reason to use a color just because it is a particularly pretty one. Every color can be the perfect choice in certain situations. However, there are a limited number of appropriate color choices in a particular instance. Don't make the mistake of using colors because the swatches looked good together on your dining room table. It is almost too obvious, but many times designers forget to consider the colors that are already present on the field  the guard uniforms, the color of the band uniforms, and the color of the props that may be on the field. Often times, just using one color that is already present on the field in a flag design will make that flag feel right at home. Anyone who might be reading this is certainly aware that there are warm colors, cool colors, vibrant colors, subdued colors, sixties colors, classy colors, dungeon colors, heavenly colors and everything in between. It almost goes without saying that the mood of the music should be reflected in your color choices. The mood depicted by a color is affected by the colors it is used in combination with (contrasting colors create tension) and also by the amount of color used. Some people certainly have a better eye for color than others. If you know people who have a flair for color, ask them for advice. It is always wise to seek the opinions of a few others regarding the color combinations you are considering. It never hurts to sketch your flag designs using colored pencils or markers. The opinion of a judge is not of as much value after you've made a set of flags. Two heads are almost always better than one! One way that color has been used recently is to give a flag that created-by-an-artist look by using colors that are very similar. Just as a painter mixes his paints, the flag designer can choose a few colors of the same hue. Designing beautiful monochromatic flags is certainly easier when there's a large selection of colors to choose from. One of the worst and most frequently made mistakes is making the flag too small. I say the bigger the better! Just be sure the size doesn't make spinning the flag awkward. The longer the pole is, the larger your flag can be. It makes sense that if larger flags are more desirable, so are longer poles. High school groups can easily handle 6' poles, while younger group may require shorter poles. Advanced groups often use up to 7' poles for their standard length. A few even use 7.5', but most high school guards should use from 5.5' - 6.5' poles. 5' - 30" x 44"
5.5' - 33" x 48"
6' - 35" x 52"
6.5' - 38" x 56"
7' - 41" x 60"
7.5' - 44" x 64"
If you plan to use a swing flag, make sure it is big enough. A 48" wooden dowel (3/8 inch diameter) makes a great pole for your swing flag. An appropriate size for a rectangular shaped swing flag (after hemming and excluding the sleeve) is 42" x 64". Planning to pull out all of the stops with an oversized flag that is truly oversized? If this flag is used for a short duration and one does not need to perform spins, tosses and such, then go for it! Any pole length from 6 to 10 feet is fine. Big is beautiful! The flag sizes recommended above are on the large side. It's a good idea to always make one flag first to make sure it's the desired size for your needs. To put it simply, polyester china silk is the world's greatest flag material. Don't even think about using anything else! Well, that may have been putting it a bit harshly. There are occasions when tissue lame can be used with success (don't let the repair lady get far away!). And on fewer occasions sparkle organza can be used effectively. First of all may I offer a word of encouragement to those of you considering making your own flags for the first time. The savings that can be had are huge. I'm sure you could think of a few ways you could utilize the extra funds. Please realize that a flag is just a flag and not a garment for the Pope. I have never recognized from the bleachers whether an expert tailor spent four hours making a flag or if a novice spent two. What is important is the appropriateness of the colors and designs for your show. Now for the nuts and bolts. The technique that works best for making your own flags is to first straight stitch the pieces together. Then use a zig-zag stitch over the straight stitch. Lastly, it never hurts to apply a liquid bonding such as Fray Block along all seams. Not many people use a French seam when making their own flags, but it is wonderful if you have someone willing to tackle it. French seams on straight edges are certainly more feasible than on curves. Many people get great results by using a surger. Regardless of the sewing method used, don't forget to allow for the seams and hems when cutting your pieces. The amount allowed will vary with each seamstress. Usually a half to one inch is allowed. It is always a great idea to make one complete flag before cutting out all of the pieces. You may want to make changes in your pattern or decide to allow more (or less) for the seams. To appliqué a piece on a flag, first position the piece properly and zig zag around it. Then cut the back out from the other side, leaving a half inch to be folded back and stitched down using a zig-zag stitch. Lastly apply Fray Block along all seams. Some people feel it is necessary to line the sleeve while others do not. If the sleeve is all the same color and continues onto the flag, you can do the equivalent of lining the sleeve by doing the following. Allow twice as much material for your sleeve when making your pattern. Before hemming around the perimeter of the entire flag, form a sleeve that is twice as large as it needs to be. Then hem around the perimeter of the entire flag, including closing the ends of the double-sized sleeve. If you use Velcro in your sleeve, attach it now to the double thickness portion. Next form the actual sleeve out of the doubled material. Separate sleeve pieces should be about 6 inches wide depending on the hem made. Always cut one first and sew it. Check to make sure it slides onto the pole appropriately. If you are new at sewing flags, you may waste a lot of material (not to mention time) if you don't make one first. Have fun and good luck! Flags which are hand painted or dyed most often times have an unprofessional look. If you're not a professional-caliber artist, think twice before risking it. White poles are usually the best choice and look nice when using white rifles. If you want more color you can tape them a color from the flag design. Woodgrain contact paper on poles and rifles looks great when thematically appropriate. If you tape your flags to the pole, use tape that matches your pole or sleeve color. Plastic tips on your poles help prevent sails. The material slides off of a plastic tip more easily than a rubber crutch tip. When using bolts to weight your poles, prevent them from moving around and clanking by wrapping them with foam and duct tape. Resist the urge to place such an obvious hand check marker on your poles. They're UGLY! I'm sorry, didn't mean to shout. I'll try again. They're ugly. Use a tape color similar to the pole color (and cut it in half). Another method is to slide a pony tail holder to the desired location and tape over it in the same color, creating a ridge that can be felt as well as seen. The same holds true for sabers. Use practice flags in practice. Your show flags will thank you at your last (and usually most important) performances. The flag designs in the photos above were all created by The Band Hall. From top: Boston Crusaders, Spartans, Seminole H.S., Carolina Crown. 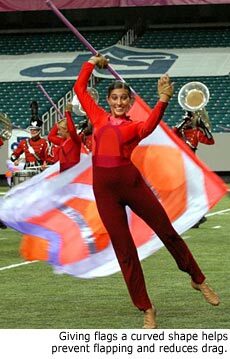 The Band Hall (www.thebandhall.com) has a highly-acclaimed design team to help you create the perfect flag, guard costume and band uniform. They also offer band accessories including shoes and the world's largest color selection of flag fabrics. Copyright 2006 Marching.com. All rights reserved. This material may not be published or redistributed without permission.